Megadeth leader Dave Mustaine has personally overseen a new 20th-anniversary edition of the band's most popular album, 1992's double platinum-certified "Countdown To Extinction," which will be released on November 6. Presented in a 2CD lift-top box and digitally, "Countdown To Extinction"'s new commemorative edition pairs the remastered original album with a 1992 concert, recorded live at San Francisco's Cow Palace, which has never before been released in its entirety. The concert audio has been newly remixed for this release. The physical and digital versions both include a booklet with a new liner notes essay by music journalist Kory Grow, and the 2CD box also contains a 24" x 36" poster and four collectible postcards. 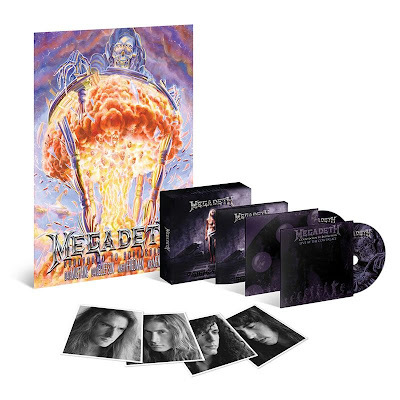 Megadeth’s fifth album, "Countdown To Extinction" was recorded in Los Angeles in 1992 as rioting raged across the city in response to the Rodney King trial verdicts. American tensions weren't limited to L.A., by any means, as the Gulf War was still fresh in people's minds, the state of the environment was becoming headline news, and President George H.W. Bush was seeking reelection in a heated campaign season. Out of this turmoil, Megadeth was inspired to create "Countdown To Extinction," considered by many to be the band's best and most accessible album. The group's previous albums, including "So Far, So Good…So What!" and "Rust In Peace," included songs that tackled topics like censorship and religious bloodletting in the Middle East. But none were as polemical as the sonic missiles launched by "Countdown." Megadeth will perform the acclaimed album in its entirety on their "Countdown To Extinction 20th Anniversary Tour" this November and December – see tour dates below. "Countdown To Extinction - 20th Anniversary Edition"